Today’s blog entry is dedicated to our Tulsa OK readers who want to learn about the process of fixing dents on their gutters. Admittedly, there’s very little that we can do to avoid damages like these simply because gutters are downright exposed to outside threats. They sustain dents from falling debris, hail, and of course, due to the daily wear and tear. What should you do if this happens? Are your gutters suffering from unwanted dents? They are not only unpleasant to the eye but they could lead to more serious issues if ignored for a long time. How do you repair a dented gutter? We prepared a step-by-step guide to teach Tulsa OK homeowners how to fix bent gutters. Before we proceed, know that the steps below will only serve as a guide. However, it doesn’t necessarily mean that anyone can do it. Here’s a friendly reminder from us here in Ranger Roofing of Oklahoma: Don’t attempt to follow these steps on your own. Consult your local gutter experts first and work under their supervision. Normally, they would advise homeowners who lack training and experience to refrain from climbing up the roof or gutters. At this point, we still believe that you need to learn about the procedure to give you an idea of what should be done and how to do it correctly. Safety Gears: Helmet, Boots, Vest, Gloves, Goggles, etc. Prepare all the safety gears needed when performing a gutter repair. Make sure you are covered from head to toe. Gears required include a hard helmet, protective vest, gloves, goggles, and boots. Without these, you’re increasing the risks of getting into accidents. The gears mentioned above are readily available at your local home improvement stores. However, these items may come in different variations depending on the need for them, so make sure you’ll get the proper gears designed for gutter works. From the ground level, try to spot where the dents are through a visual inspection. Then, prepare to climb up to perform the gutter repair by positioning your ladder away where most dents are found. Make sure that the ladder is away from obstructions. Rest it against a sturdy surface. When you’ve found a comfortable spot where you can mount the ladder, climb up to access the damaged area. 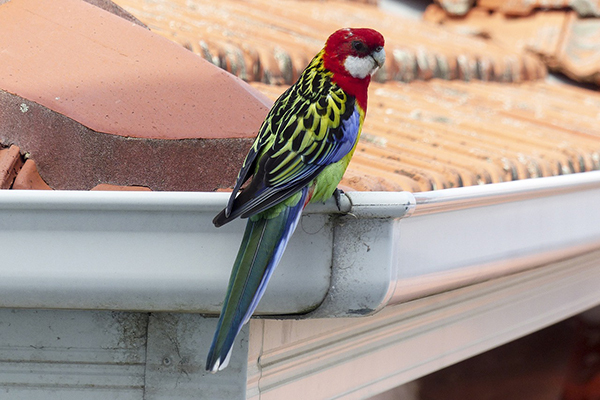 Inspect the gutters and check if there are dirt or debris lying around. These could be in the form of twigs, leaves, branches, etc. Using the cleaning materials that you’ve prepared early on, start scooping out all of these until the gutters become empty again. Wipe off the surface completely so it would be faster to pinpoint the exact problem areas. Before you begin with any roofing project, you have to make sure that it’s free from debris like dried leaves (as seen in the photo). Note that gutter cleaning shouldn’t only be done during gutter repair procedures. As a matter of fact, cleaning should be part of the regular maintenance program designed to keep the gutters in good condition. This is also done to avoid costly emergency repairs and replacements, as well as for your overall safety as a family. There are two ways on how to fix bent gutters. For minor cases, it can be solved using a rubber mallet. Be careful in handling this tool as it can create more dents, punctures, and scratches if you don’t have enough experience in using one. Here’s how to fix bent gutters using a rubber mallet. First off, locate where the dents are exactly. Then, lightly pound on these dents they disappear. Do this for all other areas where dents are present. When using a rubber mallet, make sure you apply the right pressure, otherwise, it could worsen the damages. Alternatively (and for more severe dents), you can also use an electric drill. Once you’ve found where the dents are, drill a tiny hole (about 1/8 inch in size) on them. Then, take a washer and put it on the other side. On the other end, use pliers to insert a screw carefully. This process will help flatten out the dented gutter. Repeat the procedure on all the affected areas. Don’t worry about the tiny holes as you may seal them later using aluminum fillers and caulk. 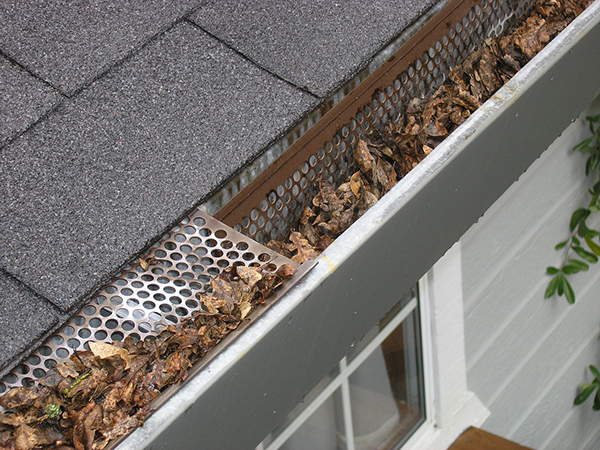 If your gutters aren’t functioning well due to unwanted issues like dents, clogging, or sagging, it can cause leaks. Failure to act on it immediately may cause water to stream down the siding or walls. It will eventually crawl down to the foundation. Too much water absorption may cause the foundation to crack. We don’t want this to happen but the entire property may collapse due to a simple gutter problem that you weren’t able to solve. Leaks are something so common to most homeowners. It’s another kind of another water damage that can stem from problematic gutters. You may think that leaks aren’t too harmful but you’re unfortunately wrong. Water can reach the ceiling, walls, flooring, and down to the basement where it could start to flood. Flooding isn’t the only consequence as it could also prompt molds and fungi to breed and propagate. This is an example of an old and neglected roof. 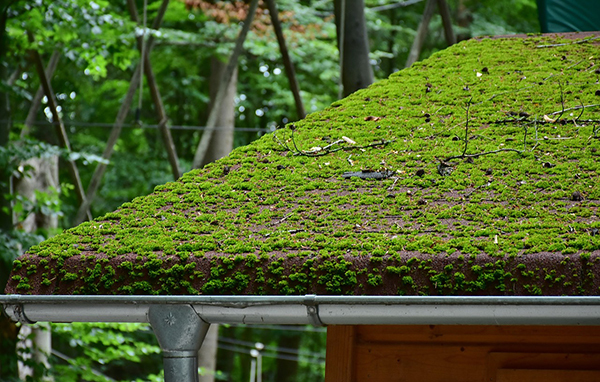 If you’ll look closely, the gutter is also dented which could be one of the reasons why the roofing has too much plant growth. Your roofing may suffer as well if you don’t know how to fix bent gutters. If the drainage system is malfunctioning, it can cause water to backflow. It has nowhere to go but back up on the roof. Once the roof shingles become too exposed to water, it can be the start of its premature deterioration. Not only that because it can also lead to leaks and other severe water damages. Having said all of these, we want to give an emphasis on the need to prioritize all kinds of gutter repairs. We’ve shown you a step-by-step guide on how to fix bent gutters but you don’t have to work on it alone. Skills and experience are needed to implement these procedures successfully. Gutters are an extension of your roofing. Hence, it’s also important to provide it with the right professional services. This will help you maximize your investments even more. Want to start caring for your gutters professionally? Contact the Ranger Roofing of Oklahoma team and receive a free estimate: 918-347-4627.